2015: 3rd place MX1 Latvian Championship,1st place MX1 Latvian Cup. 2014: 3rd place European Championship EMX300 round 1 – Bulgaria, 3rd place European Championship EMX300 round 2 – Spain. 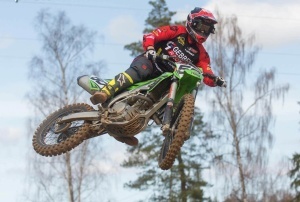 2013: 1st place MX1 Baltic Sea Challenge Cup,2nd place European Championship EMX OPEN. 3rd place MX3 KNMK ONK MOTOCROSS LOCHEM,3rd place MX3 KNMK ONK MOTOCROSS VALKENSWAARD,18th place MX1 Grand Prix Race 2 in Sweden,3rd place Latvian Winter Championship – Skijoring. 1st place in a team with Paul Jonas “Car euro 3 H Cup 2011” (3 hour endurance motocross race),1st place MX1 Adrenalin Arena CUP 2011, Estonia,2nd place European Championship EMX OPEN (450 cc) class series part in the track Nelidovo, Russia,3rd place “Latvian Cup” MX OPEN. 2010: 1st place MX2 “Baltic Sea Challenge Cup”,1st place MX2 Latvian Championship.